A UK hospital is pioneering surgery with a robot to treat patients with a fast or irregular heartbeat. St Mary's Hospital in London is using the Sensei robot, a robotic arm that feeds tiny wires through the arteries during the procedure, known as catheter ablation. Just four of these machines exist throughout the world. Unlike a human surgeon, the Sensei's movements are precise enough to avoid damaging the blood vessels with the wire. 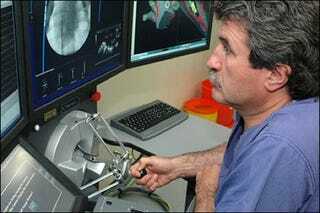 The robot is controlled by a cardiologist using a joystick attached to a computer console, and its arrival is expected to cut hospital waiting lists drastically, as few doctors are skilled enough to do the operation by hand.